Prior to this step in the process, you will need to complete Steps 1-3 above. A weighted importance of each KPI. This will allow us to score agent performance based on the priority of KPI. Threshold settings that determine what level a performance KPI falls within for Far Below Goal, Below Goal, Met Goal, Exceeded Goal. When completed, you will have an activated performance campaign for a specific team of agents and assigned team leader. This campaign will consist of a set of dashboards for agents and team leaders that includes a set of their key performance metrics, goals by time period for each metric, their actual performance for that period of time, and how they compare to their peers for each metric. Click on Performance in the main navigation bar. Click on Campaigns in the second level navigation bar. Click on the green '+' button, upper top right corner of the screen. You will be presented with a graphical tool to step you through the campaign build process. Begin by Naming your first campaign. Remember, each campaign is constructed around a set of agents handling the same type of customer interactions, being measured against the same metrics and goals. Typically assigned to one team leader. You will bring all of these components together in one team-based campaign. Best practice is to create multiple campaigns built around teams. Each campaign may have the same metrics and goals, but different team leaders and agents. As an example, Customer Service - Team Aaron versus Customer Service - Team Rosalyn. You can build as many team-based campaigns as you choose. 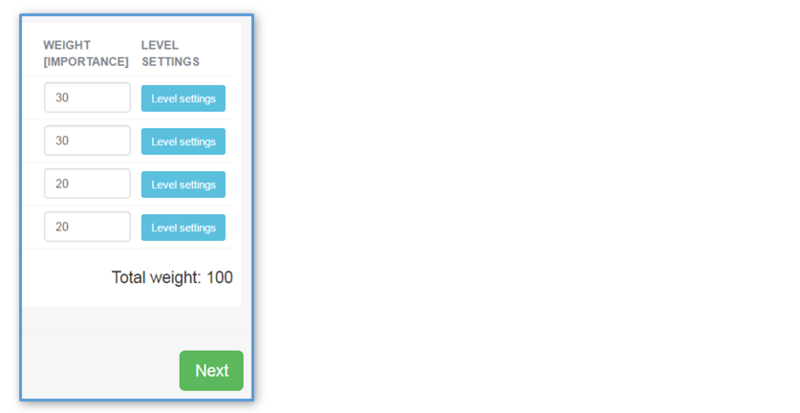 With this construction, each team leader will only see performance data for his or her team. Fill in the Campaign Name and click the green Next button, bottom right corner of the screen. Be certain to click the Next button to save your work. You can move backward in the process as long as you click the Next button. At this step, select from a list of KPIs that you created earlier. 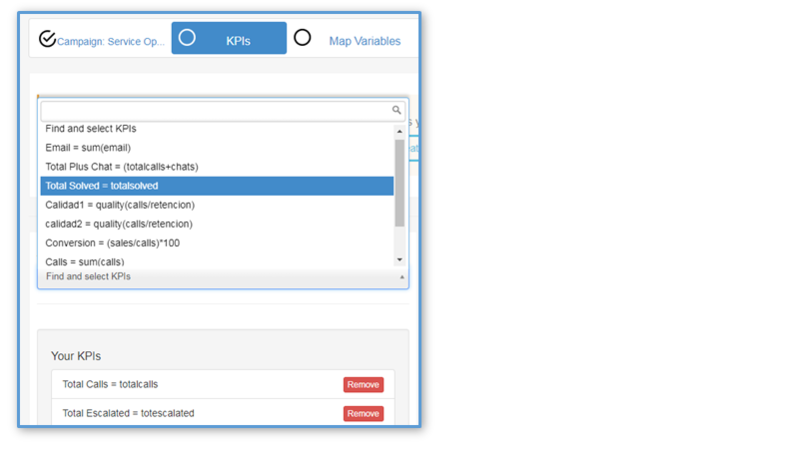 Click on the drop down field to expose your set of KPIs. These KPIs will show up as column headings for performance data in the agent and team leader dashboards. Continue working through the set of available KPIs for this campaign, choosing from the drop down list until finished. As you build out your list of KPIs, the associated variables and data sources appear in the right hand column under Datasources. In this example, it is an FTP data file as the data source with the Connector FTP Service that was created earlier. The data source should be already set. Click on Set source if you wish to change the FTP Connector (data source). There may be multiple FTP Connectors that you created. This is not an option for API. There is only one API connector required. Finish adding KPIs for this campaign and set the Connector or source for KPI data. This step is complete. Remember, Click the green Next button, lower right corner of the screen to save your work and advance to the Map Variables step. Click Next and scroll down to the the document section below 'Set your KPI goals'. If you selected FTP as your data source, we will now generate a data file to be used as a template for adding performance data to this campaign. You will NOT need actual historic performance data as yet to complete building this campaign. We will use the template file to finish the next steps. Click on 'Download template file'. This template file provides the column headings and file structure required for future file uploads of the campaign data. Do not alter the structure, column headings, or order of columns. Save the file to your laptop. It will be used to upload new Performance data day-by-day for this campaign. Do not change the file name or extension designation. You will now upload the template file to PlayVox to build this campaign. You will follow this upload step each time you have updated this file with new Performance data for this campaign. Locate the file on your laptop and select it for upload. In this example the file is service.csv. The file and data are uploaded. The template will show only two lines of fictitious users and data. Your template file will reflect those KPIs that you added to this campaign. PlayVox automatically maps, or matches, the variables in your campaign KPIs with the data source file for this campaign. In this example, the template FTP file. You can confirm the mapping by comparing the headings with the selected variable in the drop down windows of the header line. There is no reason to change these mappings. Changing mappings can generate errors in the display of the data. Remember, click the green Next button, bottom, right corner of the screen to save your work. Next, you will set goals for each of the KPIs to be displayed in the dashboards. These goals will be used to calculate goals achieved across multiple KPIs in the campaign and ranking of agents by performance scores. Again, from left to right work across the screen for each KPI in the left column. Select an achievement factor for a KPI -- Above or Equal / Below or Equal. Continue to fill in goals by daily, weekly, monthly, quarterly. Averages may apply equally across time periods. Quantities will vary across time periods. 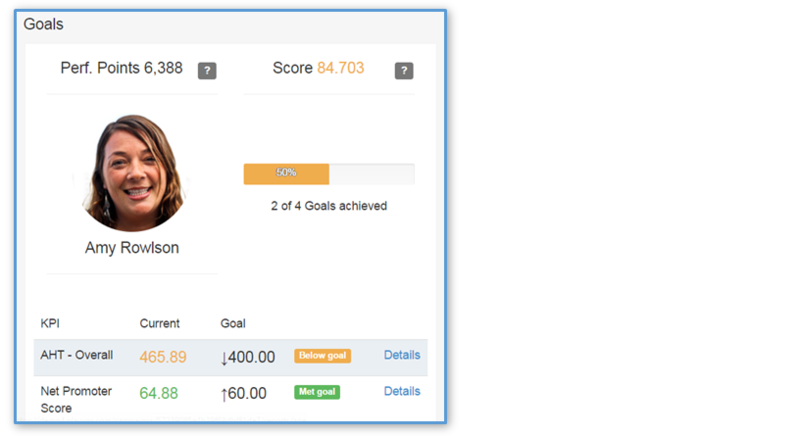 PlayVox will automatically calculate scores and goal achievement by time filter selected for the dashboard. Next indicate the unit measure for this KPI - quantity, time, etc. Then provide a weighted importance for each KPI. This weighting factor will be used to score and rank individual performance compared to peers. Weightings for all KPIs must equal 100. You must have at least a 1 value for each KPI. Finally, you can configure thresholds for the graphical representations used in dashboards to associate achievement levels with corresponding color scales. Here is a typical agent dashboard showing number of goals achieved at 50% (2 of 4) which corresponds to a yellow color and scale. And a 'Met goal' and 'Below goal' scale for each of two KPIs with a yellow and green color bar. You can set a threshold for the colors for each achievement level for each KPI. This will reflect achievement against goals for each KPI. These are presented as percent of goal met. Four levels: Far below goal, Below goal, Met goal, Exceeded goal. The column to the right provides a break down for each time period. Click on each field to set the value for a level threshold. Remember, these thresholds are based on per cent of goal met, so 'Met goal' is typically set for a range usually starting at 100% of goal but extended beyond goal. In this example 110% of goal. This assures that the green 'Met goal' level is sufficiently represented in the dashboards. Note: You can change the wording of each label by selecting Performance in the Platform Administrator drop down window under the gear in the upper right corner of your screen. A second bar scale that you can configure is for the percent of total KPI goals met within a performance campaign. These are displayed as percentage of goals met. The column to the right provides a break down for each time period. Set the color scales for number of KPI goals met in a performance campaigns. Click on the Blue Goal Bar Settings above time periods for goals. Set the thresholds for per cent of goals met of total KPI goals in a campaign. When finished configuring goals and settings, click on the green 'Next' button, bottom right corner to save your work and proceed to the next step. Assign a team, and you are finished! The last step before activating the campaign is to assign a team. If you haven't already created a team, you will do so before completing this step. Go to Performance Set Up: Step 1 - User Management for instructions to set up a new team. Continue if the team already exists. Save your goal settings by clicking on the green Next button at the bottom right corner of the 'Set Goals' screen. You will advance to the 'Select Team' screen. A list of teams that you have created should be available. Select the team for this campaign. Click on the green Next button to complete this step. Once activated, you will not be able to edit most of the parameters of the campaign. When you click the Activate button, you will be presented with a second level prompt to confirm activation. Don't activate. Save your work and activate at a later time. Activate the campaign only if you have completed all the required information and steps. If there is missing information or steps to be completed do not activate the campaign. We will save a draft of the campaign for completion later. Click Cancel. Activate the campaign for administrator review only. When you click the Activate button, you will be presented with a second level prompt to confirm activation. In this mode, the campaign is active. You have limited edits that you can make. But you can upload actual performance data from either FTP file or API data sources for agents and review the accuracy of data as displayed in dashboards. If there are errors in values as they are displayed (e.g.' % values versus sum values, or KPI forumla errors) you can clone the campaign, make your edits, and activate the revised campaign. See the document 'Managing your new campaigns'. Publish the Performance campaign to agent dashboards. Click on the Publish On/Off button to toggle On or Off at any time the campaign is active. Once activated, your campaign will be available to agents, team leaders, and administrators for view within dashboards. You may have limited data available in the dashboard when initially activated. Only the data provided in the initial file upload will be available. If data is available, your dashboard will look something like this! Performance Set Up: Step 5 - Loading data from an FTP data file. Performance Set Up: Step 5 - Loading data from an API data source.